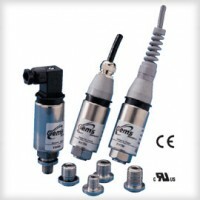 ATEX intrinsically safe version of the standard 2200/2600 series pressure transducers. The 22IC series ATEX pressure transducer features stability and accuracy in a variety of enclosure options. The 26IC extends the packaging options via an all welded stainless steel back end for demanding submersible and industrial applications. The 22IC and the 26IC pressure transducers feature proven CVD sensing technology, an ASIC (amplified units), and modular packaging to provide a sensor line that can easily accommodate specials while not sacrificing high performance.